Our books are all brand new and discounted from the full retail price! Our suppliers include Haynes, CarTech / SA Design and California Mustang. Wallets, keyrings, cufflinks, stickers, etc. 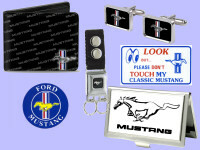 Don't forget to check out the clothing and gifts pages for lots more Mustang goodies!